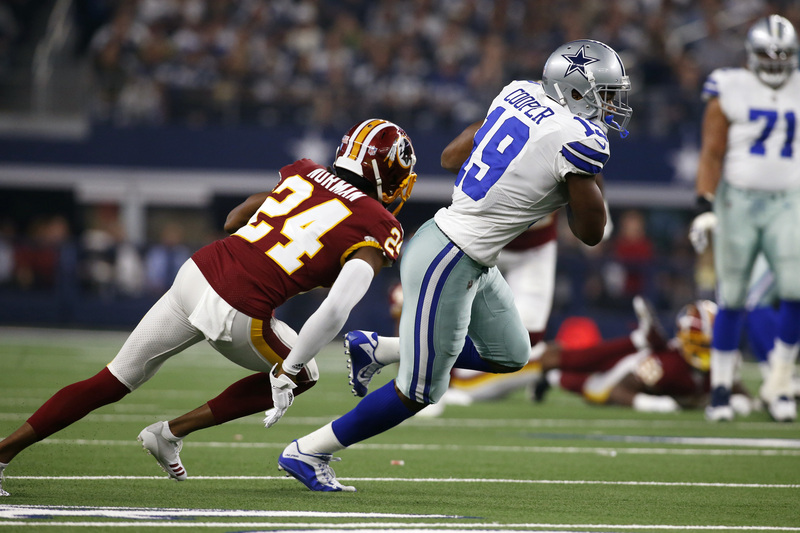 Cooper had a 90-yard touchdown after celebrating with a free throw following his first scoring catch, Elliott ran for 121 yards with his TD and the Cowboys pulled even with Washington atop the division with a 31-23 Thanksgiving win over the Redskins on Thursday. The Cowboys (6-5) won their third straight game since the first home loss, to Tennessee in the Dallas debut of Cooper following a trade dropped them two games under .500. Dallas’ eighth win in nine Thanksgiving games against Washington, and second in three seasons, earned a season split. Cooper, the former Oakland receiver had much more fun in his second home game, finishing with a Dallas Thanksgiving-best 180 yards receiving — 105 of those coming after the catch on his two touchdowns. On the 90-yarder, Cooper made the catch just outside the Dallas 30, spun out of the arms of Fabian Moreau and won the race to the pylon against Ha Ha Clinton-Dix, who tried to shove him out of bounds around the 5. It was his longest career catch and the longest completion in Dak Prescott’s three seasons. Redskins defensive end Preston Smith had seven QB pressures before halftime, the most in the NFL in the first half this season. All of them came against Cameron Fleming, who was filling in for Tyron Smith. The five-time Pro Bowler Smith was active but didn’t play after saying he experienced a stinger in the previous game against Atlanta. Smith was listed as questionable with a neck injury coming in. Smith finished with 1½ of the four sacks of Prescott — all in the first half — and had four QB hits. Washington receiver Trey Quinn, the final pick of this year’s draft at the home of the Cowboys and a former player at nearby SMU, set up his own 14-yard touchdown catch for Washington’s only lead at 13-10 in the third quarter with a 30-yard punt return to the Dallas 25. Redskins running back Adrian Peterson left briefly in the first quarter with a shoulder injury but returned. Still, he wasn’t nearly as effective as he was in Washington’s 20-17 win in the first meeting. The four-time All-Pro finished with 35 yards on 12 carries after going for 99 yards at home.